This post is an extension of my original post on Entrepreneur.com. It’s 2018 and you probably created a list of goals that you want to achieve. With so many things on your list but so little time, how can you accomplish it all? The only way to get moving and cross out more things on your list is to get more productive. Below are some science-backed proven tips that have allowed me to work on two businesses (Flux and Inston), read tons of books per year, travel the world and accomplish my goals faster than I could imagine. The Pareto Principle states that 80% of your results will come from 20% of your efforts. It is also known as the 80/20 rule. If you focus only on the most value-producing activities on your list you will accomplish far more than if you have no focus and try to take on everything that makes it to your desk. You need to work smarter, not harder. My best tip for taking advantage of the 80/20 rule is to write down all the tasks that you need to do that day (ideally the night before, see next tip) and then ask yourself: “If I can only do one activity to push my life forward today, which one should I do?” Then repeat until you’ve circled 2-3 tasks. Those will be your most important tasks of the day. Everything else should be ignored until you’ve crossed out your top tasks. 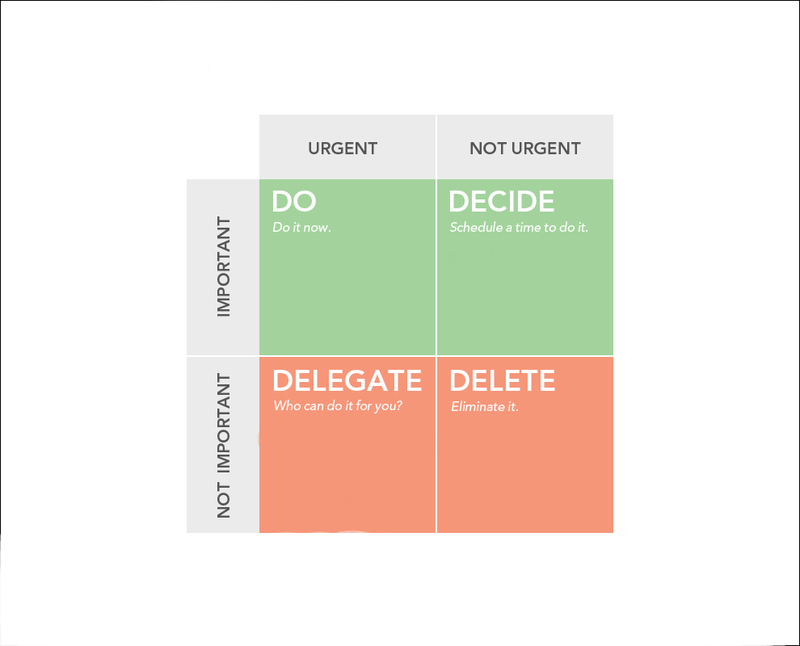 A powerful complement to the Pareto Principle is the Eisenhower Decision Matrix (also known as the Urgent-Important Matrix) shown below. This decision matrix was envisioned by the 34th President of the United States Dwight D. Eisenhower. With so many tasks and decisions to make as President, Eisenhower created a system to help him sort through the noise and allow him to focus. Tasks that are important and urgent which shall be done by you as soon as possible. Tasks that are important but not urgent which shall be scheduled for a more appropriate time. Tasks that are urgent but not important which shall be delegated to someone else. And finally, tasks that are neither urgent nor important which can safely be purged. The most productive people focus only on the top 2 quadrants. Did you know that one of the main causes for lack of sleep (or insomnia) comes from thinking about what you have to do the next day? By jotting everything down before going to bed, you can have a clear mind when going to rest, allowing yourself to recover much better. Moreover, when you go to sleep you can have your subconscious mind think about the problem and help you come up with a solution much faster (as reported by PsychologyToday). Plus, there’s no better feeling than waking up and knowing exactly what you should do that day right away. 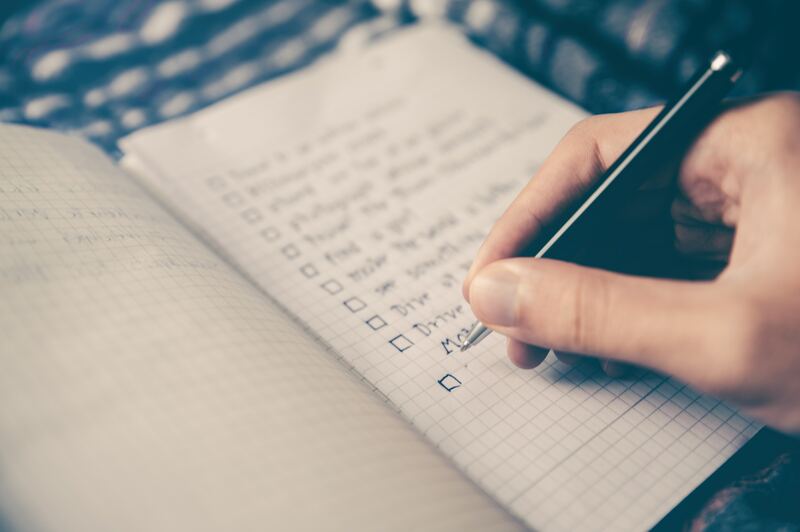 Whenever you write down your To-Do list, you should verify that your written tasks are ones that you intended to do in the first place. Too often, we take on assignments or favor requests that we should simply decline. If the majority of your list contains someone else’s priorities, you will get nowhere. Once of the simplest ways to let unimportant and seemingly urgent tasks get on the way is to have your email inbox open. Rather than following a plan, you become reactive; and what seems to be a short email can take over your entire afternoon. Unless absolutely necessary, I recommend scheduling a time to respond to emails. Being in “The Flow” means being fully immersed with the tasks at hand, ignoring any distractions and enjoying the process. The best way to be in the flow is to engineer it. I am able to work 12-14 hours each day mainly because I love what I do. When you love what you do, you will seek ways to become better, and that naturally will lead you to be more efficient. Additionally, it is important that you know the times of the day where you perform certain activities the best. Are you more creative in the afternoon? Are you a sharper salesman in the morning? Working at your peak moments will lead you do more with less effort. But, how can you sustain peak performance? 5. Work in sprints, with some smart breaks in between. A 1979 study stated that the brain can concentrate effectively for about 45 minutes before losing its focus. Rather than simply pushing through your day without any recess, it is advisable to refresh your energy bank every hour so that you can hit your next big task with a heightened alertness. A good break can include a short walk around the office, switching to a low intensity, easy task or calling that friend that you’ve been meaning to. Exercise releases endorphins (chemicals that makes us feel good), helps us get rid of toxins, and can be a tremendous energy booster. I personally like to workout when my performance is dying down (~4pm) but some people prefer to exercise in the morning. Do whatever works best with you and your schedule, but make sure you get a sweat in everyday. An added benefit of this is that you will also be adding quality years to your life, getting less sick and feeling great overall. We waste too much time with toxic people. Whether it is a boss we don’t like or a colleague we can’t stand, most of us struggle with cutting off people that drain our energy and don’t contribute positively to our lives. Avoid interactions with them at all cost. We also waste too much time with bantering, and just chit-chatting about nonsense. (It is healthy to a certain extent, but too much of it simply kills productivity). Two tips to supercharge your productivity: Put your phone on Do Not Disturb and also place a sign outside your office that indicates you are doing important work and that you have designated a certain time when people can interrupt you. Last and even worse than people interrupting you, is you interrupting yourself by checking social media or going on useless websites (the average person spends 2 hours on social media a day). I suggest you install StayFocusd (Chrome Extension) to reduce this bad habit we all have. I respect and look up to professional athletes a lot. They not only care about their performance inside the court but also design their external lives so that they can perform at their peak next time. They eat properly, they make sure that they sleep long enough and work on their craft every day. Professional athletes eat smart and you should too. Being hungry or thirsty is a productivity killer (Notice how Google, Facebook and other tech companies make sure their employees are well-fed at all times). Junk food will lead to junk performance. Proper nutrition will ensure optimal results. Snack smart and often. Eat whole grains, oatmeal, nuts, salmon, fruits (blueberries, bananas) and vegetables (dark leafy greens, carrots). You can take this up a notch by eating exactly what your body needs based on your blood type. Avoid sugar and heavy, greasy foods at all cost. Use the physiology of your body to your advantage and learn how to manage your “energy bank”. For instance, more often that not, when you feel tired or sluggish it is probably due to dehydration. I personally like to drink Matcha to power up. Akin to how athletes constantly practice and strengthen their weak spots, you must also work on your abilities so that you can get better at what you do. A master chef will beat an apprentice chopping an onion not because the apprentice doesn’t know the technique, but because the master chef has practiced that technique so much that he has internalized it. If you are an accountant, become really good at Quickbooks, learn all the keyboard shortcuts, know how to produce reports on the fly, etc. You have to practice your craft to become the best at it. 9. Reduce the clutter from your desk. Do you know why a sushi chef can create a salmon roll in just a matter of seconds while it takes me several minutes? Besides them having more experience, they also have all the tools they need right in front of them. They don’t have to search for the right knife or look out for the ingredients. There are also no other utensils or machines on their way. It is just them and the sushi roll. Same analogy applies to your workspace. Reducing the clutter will help you think clearly and will help you produce more. Without desktop clutter, your eyes won’t be distracted by any visual stimuli, and you will concentrate much better. The professional athletes learned their craft through coaches who were once professional athletes. The best CEOs have mentors who were once in their shoes. Having someone that is knowledgeable in your field can save you months if not years in achieving your goals. Without a mentor, you might be working hard and productively on a big task only to find out months later that there was a simpler and better way to get to where you wanted to go. Seek advice from people that are wiser than you. Procrastination is one of the main productivity killers. Pushing a task for later only lengthens the time it takes to finish it. It is the start that stops us. Waiting for the perfect moment is a myth. When you get started on a task, you feel great and trigger a positive feedback loop that drives more action. The easiest way to get started on a task is just to think of an action plan for it. Writing out a plan, albeit simple, is a tremendous hack. It works every single time, helping you accomplish your tasks faster than you thought possible. By having such a carefully planned out worksheet, you will fly by from a subtask to the next one with extreme clarity and no time for hesitation thinking what’s next. At each step of the process, you will know exactly where you are and how much you have left. The most productive people and top CEOs work from lists. An athlete doesn’t just show up and figures out what to do, he or she has already a routine planned out for weeks in advance. 12. Defer, Delete or Delegate Tasks. Certainly, Don’t Multitask. Even with the most advanced productivity hacks, truth is, you won’t be able to accomplish your entire To-Do list. (if you are, then your list is just too short or too easy). Remember the bottom two quadrants of the Eisenhower Matrix I mentioned before? Now, I’ll show you how to tackle those tasks. Part of being productive is knowing the tasks that you are most qualified to do. When I launched my ecommerce brand Flux Chargers, I carefully defined the tasks that I was good at (Digital Marketing and SEO) and left the rest to my team. An additional benefit of having tasks assigned by proficiency is that everyone can be held accountable and there are no diffusions in responsibilities. You will also find that hiring a VA (Virtual Assistant) will help you free up your time and liberate you from the stress of doing small menial tasks. You can find VAs on Upwork or OnlineJobs.ph. Also, as much as we hate to admit it, we aren’t wired to multitask. Research by the University of London indicates that our productivity (and IQ!) drops when we try to do more than one task at the time. It is better to focus on one task until it is completed. Computers were designed to help us reduce the amount of repetitive tasks that we need to do. Yet most of us only use our laptops for emailing and web browsing. Consider investing in software tools that can 10x your output. If you are doing email outreach, find tools like Outreach.io to source leads and to reach out to them while you sleep. If you are blogging, use Buffer or IFTTT to schedule your content to be published on all social media sites on your behalf, or any of these SEO tools to help you find keywords and analyze competitors. If you produce financial reports or legal documents, use PandaDoc templates to speed up your document creation. If you need to schedule meetings and hate the back and forth, use Calendly and let people pick a time on your calendar. To create beautiful artwork without any design knowledge, use Canva. Lastly, Slack and Google Drive are a must for collaborative work. For entrepreneurs, here are some other good resources to get started with. I get that not everyone is an early riser, but our bodies are just wired to perform better during natural sunlight hours. If you wake up early, you will find yourself with a calm and distraction-free environment. There won’t be anyone calling, texting or emailing you at this hour. You can use this power hour to meditate and visualize how you want your day to pan out. You can also use this time to work on life goals that are not related to your job. Create a routine for yourself that puts you on beast mode for the day. For me, it is showering, eating breakfast and rapping. You can try playing upbeat music to feel like Rocky. You can also remember how lucky you are by creating a gratitude journal. Studies have shown that playing music in the background and low volume can increase your productivity. I like to take this tip to the next level by playing a “white noise” playlist on Youtube, that way I can complete tune out any sort of external sound and tune in to my 13’’ computer. If you drive just 15 minutes to work each way you could use those 170 hours per year to learn a new skill. Although I am a firm believer that consistency can really boost your productivity, sometimes working from a different place can also help you escape the perceived routine job you might be doing. When you are exposed to new stimuli, you might find yourself thinking about new ideas and coming up with creative ways to solve your problems. How can you be sure that your productivity is increasing if you don’t have a metric for it? Can you push out more code reviews in a week? Have you decreased the time it takes you to write a 1000 word blog post and increased its quality at the same time? Whatever metric you want to use, set up some targets that will push you outside of your comfort zone. It can be money, your reputation, or an embarrassing bet. Having something on the line will make you work harder to make sure you deliver on your promise. Those are all the tips I know to help you become the most productive person around. Try them out for a month, and you will see tremendous results in your life. If you know any other tips, please share them in the comments. Ready to crush your 2018 goals?